Actuator Solutions for Farming and Ventilation Applications | Venture Mfg Co. The farming industry has grown by leaps and bounds due to the adequate use of various technologies. Venture Mfg. Co. has been one of the organizations leading this technological change in the agriculture and farming industries. We provide linear and electric actuator solutions for ventilation and farming applications. Our systems are designed to support ventilation systems, temperature and climate control machines, as well as automated systems used in other farming applications. The points below elaborate on these applications. Feeding Automation: Our linear actuator systems are designed to properly control the grain handling processes. The actuators can handle many pounds of force, provide excellent position accuracy, and also have self-locking capabilities. By using our products, farmers will have the ability to ensure efficient grain dispersal without any wastage, and prevent any accidents in the process. Grain Handling: Various treatments include use of laser rays that need to be positioned very precisely. If factors like velocity, accurate position, or stability are not controlled, it could lead to damage to the patients. Linear actuators help in monitoring and controlling these factors in a laser positing device. Slurry Tanks: We provide electric as well as linear actuators to support transfer of manure from tanks to silos to biogas plants. They help farmers handle the manure management process without getting exposed to any hazardous fumes or contaminants. 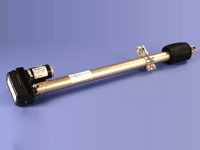 Climate Control: Farmers can utilize our electric linear actuators for climate control purposes. They help balance the temperature inside a stable to ensure welfare of the livestock. Our solutions are user-friendly, and can help ensure good living conditions for the livestock, while improving work speed and efficiency. Ventilation Systems: We offer linear and electric actuators for natural ventilation systems. With the use of our actuator products, ventilation systems can be automated to maintain adequate levels of air flow, temperature, and oxygen. Venture Mfg. 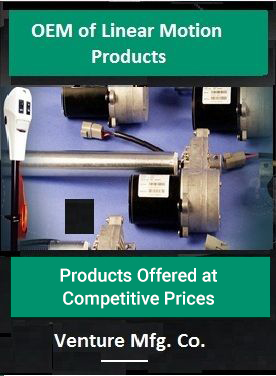 Co.’s inventory comprises a variety of actuators for ventilation and farming solutions. We also provide different ancillary products and services. We can provide these products in custom designs to meet the needs of our customers. Our actuator solutions are known for benefits like noiseless operation, precision in terms of positioning and movement, and minimal maintenance. Please click on any of the applications for more details.